The course is The Science of Natural Healing and Presenter Dr. Mimi Guarneri offers you the opportunity to take a highly proactive and informed role in your own healthcare—to make use of the best of nature-based medicine, to live a nurturing lifestyle, and to care for your own well-being in the most comprehensive and far-reaching way. These 24 compelling and practical lectures offer a rich spectrum of choices and possibilities for your own healthcare, as well as practical tools for creating a truly healthful lifestyle. In the 21st century, the Western paradigm for healthcare is changing. Notwithstanding the great strengths of medical science, many people now have concerns about key features of our health-care system-among them, the widespread use of medical drugs and a relative de-emphasis on preventive care. But traditional Western medicine is not the only healing system rooted in science. Medical systems from other cultures, including those of India and China, have used natural treatments for centuries, some of which are now directly influencing our own health-care professions. These approaches not only emphasize healing with natural substances, but devote considerable attention to illness prevention and healthful living by considering the whole person rather than just targeting a condition. What is the most effective way to nurture your own optimal health? Are there sound alternatives to the drugs so common in our health-care system, which can carry unwanted consequences and side effects? What about the range of natural methods, such as herbal medications, micronutrients, and the use of food itself as medicine? Are these approaches valid? And, if so, can we integrate the best of Western medicine with the best natural treatments to enjoy prime health and longevity? Dr. Mimi Guarneri bridges the gap between heart and soul, fusing the latest in science and technology with the deeper realization that the human heart is more than a physical pump. Choose either the 4 disc DVD set with 24 of Dr. Guarneri’s 30-minute lectures on video; or listen to the CD set. You can order the DVD or CD set from Pacific Pearl La Jolla, 858-459-6919. Investigate the fundamental paradigm of Western medicine—its strength in the treatment of symptoms and its relative deemphasis on illness prevention and long-term health concerns. In contrast, consider an approach to healthcare focusing on the whole human being, integrating the elements of your environment, genes, lifestyle, nutrition, and mental/psychological makeup. Holistic integrative medicine creates a bridge between Western medicine and the world’s other evidence-based healing traditions, making a spectrum of health-care approaches available to you. Learn the philosophy underlying integrative medicine, rooted in partnering with the patient, finding the underlying causes of disease, and caring for the body, mind, and spirit. This lecture highlights the critical relationship between your genes and how you live your life. Investigate the ways in which nutrition, lifestyle, and stress can affect the outcome of your inborn genetic makeup. Explore the fields of nutrigenomics and pharmacogenomics, which study the interaction of nutrition and medications with the genes. Holistic integrative medicine speaks deeply to the connection between food and health outcomes. Here, track scientific findings that demonstrate how the food you eat directly affects your heart health as well as numerous medical conditions. Learn about the benefits of the Mediterranean diet and the kinds of foods that promote optimal health. Certain key foods have unique properties that set them apart as nutrition “superstars.” Starting with the importance of whole foods and fiber, study the most healthful foods in different categories, including grains, legumes, fruits, vegetables, and proteins, and grasp how the way you cook food affects its nutritional value. Inflammation, a fundamental protective reaction of your body, is also a pathway to many diseases. Discover the multiple causes of chronic inflammation, from pollutants and bacteria to stress and sleep disorders. Learn how to use food as medicine, emphasizing a variety of foods, herbs, and spices that prevent and/or reverse inflammation. Perhaps surprisingly, numerous physical symptoms and medical conditions can be triggered by sensitivity to foods. Study the six primary food groups related to food sensitivity and allergy, examine the astonishing data linking them to conditions such as migraines and arthritis, and learn about the elimination diet, which locates the specific source of food-related symptoms. This lecture introduces the central subject of natural supplements. First, investigate the natural products industry and how to determine the quality and purity of supplements you may use. Then study key supplements, including probiotics, selenium, and vitamin D, and their effectiveness in treatment and prevention of ulcerative colitis, diarrhea, and cancer. Many natural herbal substances have proven and significant healing properties. Discover the remarkable medicinal uses of aloe, ginger, and licorice for the GI tract, and of cranberry and saw palmetto for urogenital conditions. Also follow a case study showing the diagnosis and herbal treatment for a patient with chronic migraines. Pharmaceuticals are not the only avenue for reaching healthy cholesterol levels. Begin by investigating the two kinds of cholesterol and the triglycerides, and their role in your physiology. Learn about specific foods that raise and lower cholesterol and triglycerides, nutritious alternatives to animal protein, and key natural supplements for controlling your cholesterol. A surprisingly rich array of natural treatments is available to counteract high blood pressure. Review the startling statistics showing how blood pressure is lowered by both weight loss and reduced sodium intake. Also study the marked effects of foods, including garlic and seaweed, and micronutrients such as magnesium, vitamin D, and the enzyme CoQ10. Diabetes is the result of a continuum that begins with the preconditions of insulin resistance and metabolic syndrome. Learn how all of these conditions are directly linked to lifestyle, and how to prevent and even reverse them through the kinds of foods you eat, healthy sleep patterns, and consistent exercise. In the first of three lectures on stress, you investigate the body’s stress response. Study the three stress hormones, the physiological changes they produce, and the unhealthy effects of both acute and chronic stress. Also track the psychological impact of stress, and stress’s effects on the immune system and aging. Your response to stress is intimately related to how you view the world. In learning to neutralize stress, map your own emotional life and consider research on the effects of positive emotions. Then learn a technique, using focused breathing and imagery, for reaching a positive feeling state and disarming the stress response. Mind-body techniques are now shifting the paradigm of Western medicine. Learn practical ways to use them in your own life, and review their remarkable clinical effects, including the use of meditation for lowering blood pressure, yoga for treating spinal problems, and mantra repetition in treating post-traumatic stress disorder. Holistic medicine also offers many avenues for responding to issues of mental health and well-being. Here, explore research on the role of nutrition and nutrient deficiencies in depression and bipolar disorder. Consider holistic approaches to treating depression, including the specific uses of diet, exercise, herbal remedies, and light therapy. “Biofield” or energy therapies, although controversial, show ample evidence of a positive impact on health. Study the principles of acupuncture, tai chi, homeopathy, and Healing Touch, as well as clinical data on their use in treating a spectrum of conditions, including pain, stress, and cardiac disease. This lecture poses the question, “Do personal relationships affect health?” Review the extensive clinical research correlating supportive parental, spousal, and social relationships—as well as optimism—with more favorable outcomes for major diseases. Consider the evidence for social connections as treatment for illness and as key ingredients of good health. Increasingly, research is showing a strong connection between spirituality and health. Investigate the evidence demonstrating greater resilience to disease among spiritually active people, and why this may be so. Explore the medical implications of depression and hopelessness, and how holistic medicine integrates physical, mental, and emotional healing. Holistic integrative medicine views spirituality as an element of optimal health. In approaching spiritual wellness, track research on forgiveness and positive thought and their effects, both physiological and psychological. Learn specific ways to develop an affirmative emotional outlook, including working with your internal thought patterns and practicing gratitude. 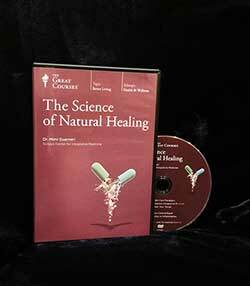 Here, a patient case study demonstrates the integrative approach to healing. Follow the story of a woman whose profile showed diabetes, depression, high blood pressure, and arthritis. See how a comprehensive health plan for her included the factors of dietary changes, micronutrients, specific exercise, stress-reduction tools, and social connection. In critical ways, human health is directly linked to the health of our planet. Track the effects on human bodies of environmental factors, including climate change, air pollution, greenhouse gases, the livestock industry, and industrial chemicals, and consider approaches to addressing these matters effectively. This lecture looks at constructive actions that impact not only your own health, but the health of the planet. Investigate ecologically sound choices such as buying organic foods and reducing the use of plastics, as well as actions by governments and health-care facilities to eliminate hazardous substances and foster healthy food production. The course concludes with a look at a final fundamental element of your healing: yourself. As provocative food for thought, review research on the question of why people heal and examine clinical evidence on the influence of the patient’s outlook and beliefs on the healing process. These lectures are not designed for use as medical references to diagnose, treat, or prevent medical illnesses or trauma. They are options and possibilities for your healthcare and tools to help create a healthy lifestyle. If you have questions about a diagnosis, treatment, or prevention of a medical condition or illness, please consult a qualified physician.